Congratulations to Fenwick on taking the State crown on Friday, March 22 – winning their first State championship title ever! They faced off against the reigning 2018 Champs, New Trier, beating them by a score of 3-2. New Trier went up early in the first period when Ella Huber got the puck in front of net for the Trevians and fed it to Sabrina Shvartsman for the first goal of the game. Shortly after on the power play, New Trier’s Huber scored again putting New Trier up 2-0. Fenwick was able to come within 1 goal late in the first when Erin Proctor picked up her own rebound to get the Friars on the board. Later that period a penalty on a breakaway gave Ellie Kaiser a chance to level the score…and she did. The Friars would go to work on the power play in the third period, taking a 5-on-3 man advantage and netting the game-winning goal thanks to a great shot by Kaiser. Both goaltenders battled hard, with Friar’s goalie Lena Flores making 24 saves, including several point blank saves in the third to seal the victory. Another Metro League season is complete! In the Scholastic Cup semi-finals, Fenwick High School beat Loyola by a score of 9-1 and New Trier topped Naper Valley in a tightly contested 4-3 win. In the Founders Cup semi-finals, Lake Forest High School beat Lake Forest in another close game with a final score of 3-2 and Glenbrook and Warren battled it out in a game that went into two over time periods. In the end, Glenbrook won, and the final score was 7-6. The championship games were held on Monday, March 18 at Lake Forest Academy. Lake Forest High School won the Founders Cup, beating Glenbrook by one goal. The final score was 3-2. Fenwick was named Scholastic Cup Champions, beating New Trier 5-2, with two empty-net goals scored by Ellie Kaiser in the final minutes of the game. Congratulations to all on a wonderful season! The six ladies named to the 2019 Blackhawk Alumni High School All-Star Team attended the annual Keith Magnuson Scholarship Luncheon on March 5 where they got the chance to mingle with a number of Blackhawks and Blackhawks dignitaries. 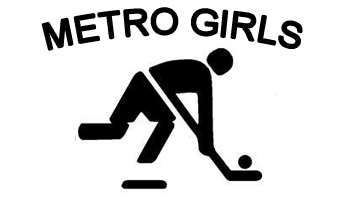 The girls named to the team this year include Maddie Babnik (New Trier, Defense), Kate Pohl (Latin, forward), Ella Huber (New Trier, forward), Lyndie Lobdell (Naper Valley, defense), Erin Proctor (Fenwick, forward) and Lena Flores (Fenwick, goalie). 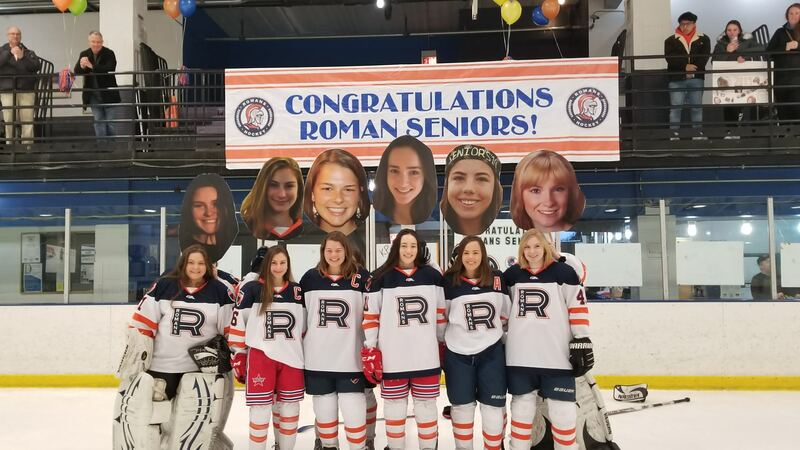 The Latin Girls team celebrated its 2019 Senior Night on Thursday, February 28 when they faced off against the Rebels and won 7-0. Seniors graduating include goalie, Mairead Harris, Kathryn Pohl, Margo Williams, Sadie Heller, Madeline King and Caleigh Ridge. Harris had a shutout, and all of the senior skaters contributed with points. The Fenwick High School Girls hockey team honored nine graduating seniors in late February in a great game against Glenbrook. All of these ladies were an important part of the team over the past several years and many of them represented Fenwick together for all four years of high school. Good luck ladies! 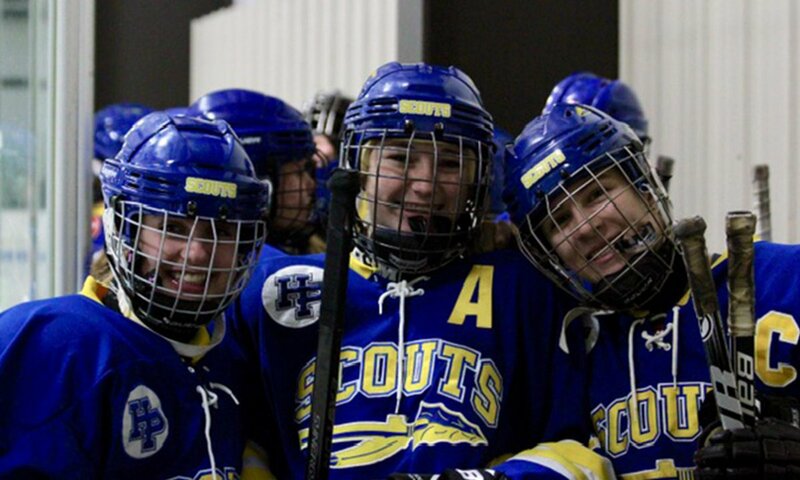 The Lake Forest Scouts were featured in an article by Stephen Kerr that was titled “The Lake Forest Scouts One of Many Teams to Benefit from Global Girls Game” and ran on USA Hockey online. The kudos came from their involvement in this annual event that takes place with successive games around the world that was help this year during the weekend of February 15, 2019. Sponsored by the International Ice Hockey Federation (IIHF), the fourth annual Global Girls Game, features approximately 40 countries hosting games in succession around the world to celebrate girls’ hockey. Lake Forest faced off against Evanston in one the event and after falling behind 3-0 in the first period, rallied with nine unanswered goals for a 9-3 victory. Thanks for your efforts to celebrate girl’s hockey ladies! Have a wonderful off-season – see you all in the Fall!